Description: Hockey stick and stealth schemed units eatbound under the cantilever (removed Aug. 4, 2008) at Reusens, VA. 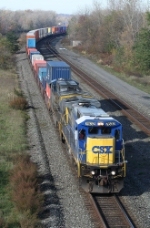 Description: CSXT Northbound Coal Train rumbles through Tanner, Al. Description: Charginf east through Pine Junction on a cold but beautiful February afternoon. Description: A group a six axle units sit in the yard at Junta. Description: An eastbound merchandise knocks the signal down at mile post BF 187.0 on the Keystone Sub. Description: Taken from the front porch of GLLX 3003 at 2:20AM. Description: not sure on year or date. Description: Q364 eastbound at Amsterdam station. Description: One of only a handful of ex-WM SD40's left leads the Q276 east at 3:55PM. Description: Q362-07 heads eastbound on track 1 at CP 245 on the CSX Indianapolis Line. Description: Q362-07 heads east on track 1 at CP- 245 on the CSX Indianapolis Line. Description: Sunnymeade Rd., 0845 hours.